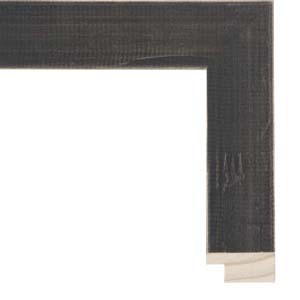 This distressed black picture frame moulding is a popular choice due to the appealing 1 ½” width and also the price value. This picture frame looks good with a wide array of artwork, from black and white prints, to pencil and charcoal drawings, to more colorful items where a dark gray or soft black color is desired. 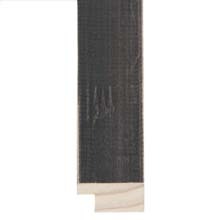 The versatility of this black picture frame allows it to be used for many themes. Art from India and Thailand, such as batiks, might pair nicely with this frame, along with street art from Paris, horse art featuring black stallions, psychedelic art with fine details, and music or movie posters, especially concert posters such as silkscreened fine art prints. Additional possibilities include framing scenes that feature silhouettes, such as black and white photography and cityscapes. Possible matboard colors to use in conjunction with this black wood picture frame include gray or black acid free archival matting option such as Sandhurst 9862, Field Mouse 9597, Before Dark 9598, Coffee Bean 9842, Peat Moss 9611, and Jet Black 9848.